LONDON - There are parallels between the way companies in North America and Britain are holding back on investment as they wait for clarity on the re-negotiation of NAFTA and the outcome of talks on a Brexit deal, Canada's finance minister said on Monday. 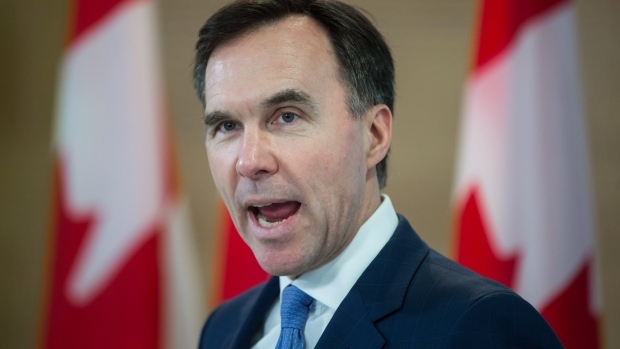 "Certainly anecdotally in North America there are some businesses that are being cautious about investments because there is an expectation that NAFTA could be slightly different tomorrow than it was yesterday," Bill Morneau said in a speech in London. "I just assume that is a similar situation here. Hopefully (that's) one to be overcome as more clarity comes out." Canada and Mexico have won exemption from U.S President Donald Trump's planned tariffs on steel and aluminum imports, pending renegotiation of the 24-year-old North America Free Trade Agreement. Morneau said he was "cautiously optimistic" that the three countries would be able to reach agreement on changes to NAFTA requested by the United States. Canada's ability to avoid the tariffs was positive for the future of the trade treaty, he added. "The demonstration of our relationship that came through this discussion bodes well for the future, in terms of any future discussion around tariffs or for that matter around NAFTA," he told reporters after his speech.